When Honda launched the CRF1000L Africa Twin in 2016, the bike was very well received by the media. At a time when adventure bikes were becoming bigger, heavier and more complex, the fairly simple and straight-forward Africa Twin was a welcome breath of fresh air. 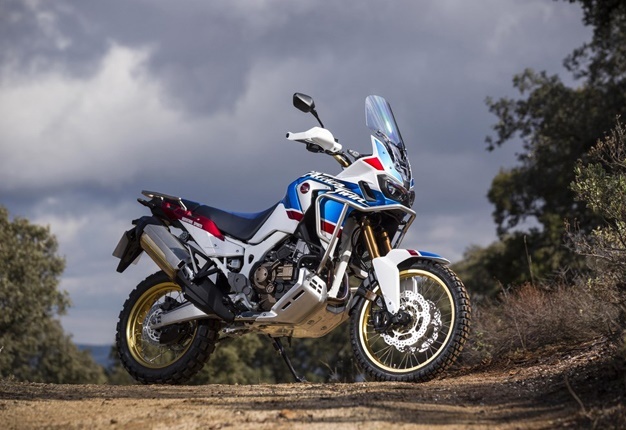 Now, 31 years after the legendary name first appeared on the XRV650, Honda brings us the Africa Twin Adventure Sport, the latest version of their competent big adventure twin. The Adventure Sport boasts a number of new additions. Added to the mix is a flatter seat profile, more upright riding position and increased wind protection from the screen and fairing. It also features a large sump guard, a 5.4L fuel capacity increase (which, Honda claims, extends the bike’s range beyond 500km), heated grips and an AC charging socket. Other significant additions are a new ride-by-wire system with three riding modes (Tour, Urban and Gravel), and seven levels of traction control. Honda gave us the DCT (automatic) version, finished in a catchy white, blue and red colour scheme that pays homage to the XRV 750, to review. The colour scheme attracted a lot of attention and during the review period it was not unusual to have people come up and look at the bike when I stopped. The Adventure Sport is noticeably taller than the standard version. Seat height has increased from 850mm on the standard version to 900mm on the Adventure Sport. At 1.78m tall, I found that only the balls of my feet touched the ground, which was a little disconcerting when riding a tall, heavy bike in traffic. While this could be a problem for shorter riders, the positive spin-off is a 20mm longer suspension travel and a similar increase in ground clearance. I initially struggled with the DCT on the road – in heavy traffic it felt as if the bike was always in the wrong gear – until I figured out that (counter-intuitively) Sport mode works better during really slow riding. I also tried riding in manual-shift mode, but being unfamiliar with paddle-shift I found that it took away from my concentration in demanding traffic conditions. Using paddle-shift in less dense traffic worked well, though, and it also allowed me to use engine braking more effectively. Both in manual and sport modes the engine auto-blips on downshifts. I reconfirmed my opinion from the 2016 launch that the DCT works extremely well off the road. As a less-than-expert off-road rider, I appreciated the ability to concentrate on the road (or lack thereof) rather than which gear I am in, as well as not having to shift when I ride standing up. Here, too, the increased ground clearance was welcome, especially in the rough stuff. The centre of gravity felt less worrisome in the dirt, and the bike’s balance was good enough that I could confidently ride extremely slowly when the going got rough. While the Africa Twin isn’t the most powerful adventure bike I’ve ridden, the power and torque are sufficient to make it fun to ride, both on and off the road. At speed, wind protection, which seemed borderline in town, turned out to be surprisingly good – so much so that I occasionally found myself going a great deal faster than I thought. Power and wind protection makes the Africa Twin a credible long-distance bike, which begs the question why Honda saw fit not to equip it with cruise control, something which is all but ubiquitous on competing adventure bikes. The Africa Twin isn’t perfect, but it remains one of the better entries into the adventure bike market. It has proven itself as an extremely competent off-road bike and can stand its ground as a long-distance tourer. Despite the additional electronic wizardry, the Adventure Sport retains the feeling of being a simple, honest and trustworthy machine. And when you’re out in the sticks, where cell phone reception is just a dream and skilled mechanics are few and (quite literally) far between, that’s exactly what you want your bike to be.